Yet another longer music and dance festival is held at Bharat Kalachar, T. Nagar, Chennai. This one comes from the famed PSBB School campus and management. This year the festival starts on Nov. 26 and goes on till Jan. 16, 2012. View schedule on Bharat Kalachar Website. 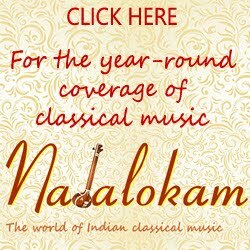 7.10 p.m. - Anooradha Sriram and Sriram Parasuram - Hindustani and Carnatic Jugal bandhi. 6.00 p.m. - Anil Bajpai & Neelima Gokhale - Ragas and Rafi - special programme to celebrate Mohd. Rafi's birthday. Madhuvanthi Arun - guest singer. 10.30 a.m. - Jayalakshmi Santhanam - Vocal, Sheela Rajendra - vocal support, R.K. Sriramkumar - Violin, J. Vaidyanathan - Mridangam, N. Guruprasad - Ghatam, A.S.
Carnatica organises one of the earliest series of concerts of the season. Titled 'Bharat Sangeet Utsav', the concerts have a variety - classical Carnatic, Hindustani and a couple of fusion music performances. The series will be held from Oct. 29 to Nov. 7 this year. Venue: Narada Gana Sabha, TTK Road. All the 3.00 pm concerts and the 10.00 am concert on Nov. 6th are FREE! For the evening programs (5.00 pm and later), 50% seats will be free. Seating will be strictly on a first-come first-served basis and cannot be reserved beforehand. The remaining 50% will be for donor pass holders who wish to reserve a confirmed seat beforehand. The Mylapore Fine Arts Club will honour musician Aruna Sairam with the title ‘Sangeetha Kala Nipuna' and dancer, guru and choreographer Adyar K. Lakshman with ‘Nrithya Kala Nipuna' title for the year 2011. These awards will be presented on the inaugural day of the sabha's art festival on December 11, 2011. 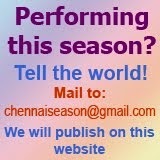 Kartik Fine Arts hosts the longest annual festival in Chennai every year. The sabha honours artistes from various fields with titles and awards. For 2011, the title Isai Peroli will be presented on vocalist Pantula Rama. Guru Karaikudi Mani Award : Nellai A. Balaji (mridangam).